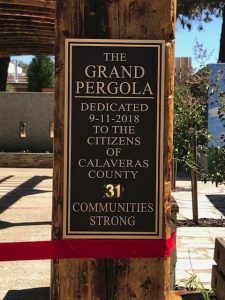 On September 11, 2018, a ribbon cutting ceremony was held at the Government Center Campus to dedicate the new beautification additions to the plaza near the Board of Supervisors’ Chambers. Among the new additions to the plaza are a set of wooden arches lining a paved walkway and landscaping with over 800 plants, shrubs, trees and ground cover acquired from a local nursery. Thirty-one trusses to represent the thirty-one communities in Calaveras County support the arches. The words “31 Communities Strong”, is visible on a plaque next to the arches. This Beautification Project has been a collaborative effort of Calaveras Community Foundation, the California Department of Forestry and Fire Protection, the Master Gardeners and the Garden Club. The Calaveras Community Foundation provided the grant funding and incentive to start the project. Cal Fire repurposed and contributed pine trees that were affected by bark beetles as the wood building materials. The Garden Club contributed plants and labor to landscape a portion of the area. Master Gardeners contributed their expertise in the selection and placement of the plants. County Facilities personnel began working on the grounds in September 2017. “The project being made from steel, stone and timber will forever symbolize the strength and longevity of our community,” states Patrick Martin, Facilities and Grounds Manager. Calaveras Community Foundation Board of Director members Linda Kangeter, President and Brent Harrington, Treasurer, were in attendance and provided the photos below. 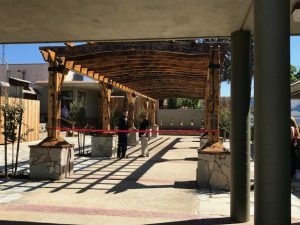 Completed Pergola at Calaveras County Government Center. Sign on The Grand Pergola recognizing the 31 communities in Calaveras County.